Pipewort is not easily confused with other wild plants on this web site. 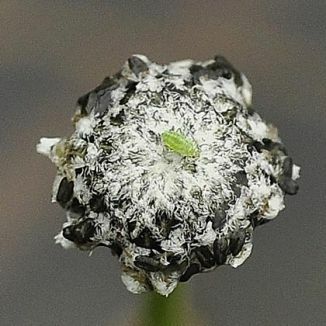 Here in Ireland, Pipewort is not too commonly found, being confined to western areas such as Donegal, Connemara and Kerry. 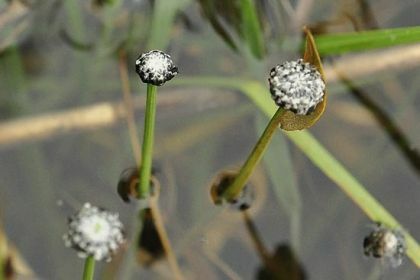 It grows in bog-pools, shallow, peaty water and lakes where its erect stems bear little domed heads (10-14mm across) of tiny, grey-white flowers, between which are minute dark-grey bracts. The effect of this combination is like a small padded button on a tall stick – a bit like a knitting needle with its round head poking out of the water. The stems are leafless, there being a submerged basal rosette of translucent, narrow leaves at the base of the stem. A monoecious flower, it bears male flowers in the centre of the head with female flowers surrounding them. This is a native, perennial plant, blooming from July to September and it belongs to the family Eriocaulaceae. This species occurs mainly in North America – perhaps it's only a relatively 'recent' arrival to our shores. However it is classed as native and therefore probably has been in Ireland for some considerable time as to be termed 'native' a species must have been recorded prior to 1500 AD.